The top photo shows the front of the auction bid paddle. The bottom photo shows the thematic approach taken and how the sponsor logo was added into the design. 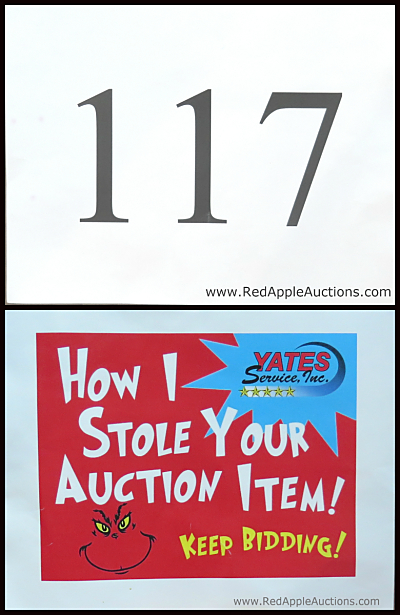 Some nonprofits will print a guest’s bid number on both sides of an auction bid paddle. The benefit of this approach is that regardless of which side of the paddle is shown to the auctioneer, the bid number is viewed. Another idea is to sell the space on the back of the bid paddle. The back of the bid paddle can be combined with other benefits and offered to a single sponsor at a high commitment level, or it can be sold as a standalone benefit to a company underwriting a specific expense, such as a company that covers the fee of hiring a professional benefit auctioneer. This was the first year the nonprofit offered this idea as a benefit. They pitched the idea to a company that liked it and agreed to sponsor. But rather than simply printing the corporate logo on the back of the paddle, the Suess-inspired theme continued onto the back of the bid card. “How I Stole Your Auction Item” (a play on “How the Grinch Stole Christmas”) was printed onto the back. Another nonprofit client offers this opportunity annually; the same realtor has bought it every year. Like with the Suess-inspired example I’m featuring in this photo, the realtor also makes an effort to match the auction’s theme. For instance, she always includes a photo of herself on the bid paddle, and edits her image to tie into the auction theme. She might add a disco ball for a “Flashback to the 1970’s” concept, or don a cowboy hat for a Western night. Offering the space on the back of the bid card is typically an easy benefit to add to your sponsorship or underwriting offerings. Have you considered selling the real estate on the back of your bid card? For the right buyer, it’s a valuable perk — and unique to your event.